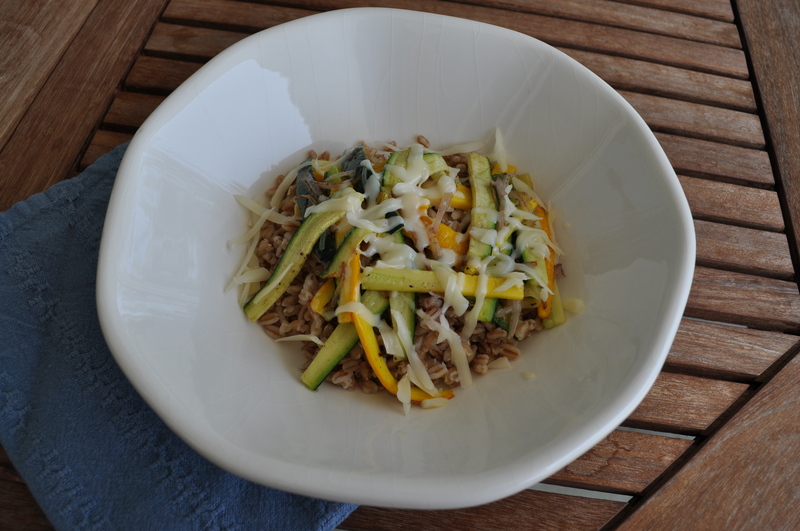 Stir-Fried Zucchini with Farro – Got Nourishment? Summertime and 80 degree weather calls for sandals, iced-coffee, and the farmers market! This past Sunday I made a trip to the market for a delicious veggie quesadilla that I had been dreaming about and couldn’t help but pick up a few items to take home as well. Colorful squash, spinach, rainbow chard, and plump blueberries all snuck into my bag. This dish is super simple, quick, and is perfect for one! On the other hand, it’s very easy to multiply for a larger crowd. I used quick-cooking farro from Trader Joe’s, which directs you to combine the water and farro, bring to a boil, then cover and simmer for 10 minutes…much like quick-cooking steel-cut oats! I like my whole grains. 😉 You can use any style of farro you like, but I used this one because it cooks up quickly. If you haven’t heard of farro, not to be confused with Pharaoh, it is an ancient whole-grain common in many Italian dishes. 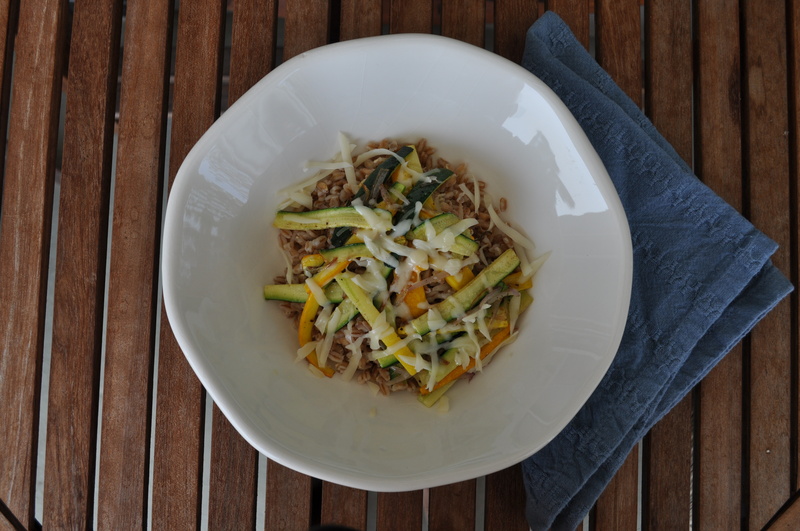 Farro is high in fiber and is a good source of iron and protein. According to On Food and Cooking, farro, also known as emmer wheat, was probably the second wheat to be cultivated. Common in the Tuscany region of Italy, it is made into winter soup with beans and is also used to make farrotto (like an alternative to rice in risotto). Goods from the Sunday farmers market! 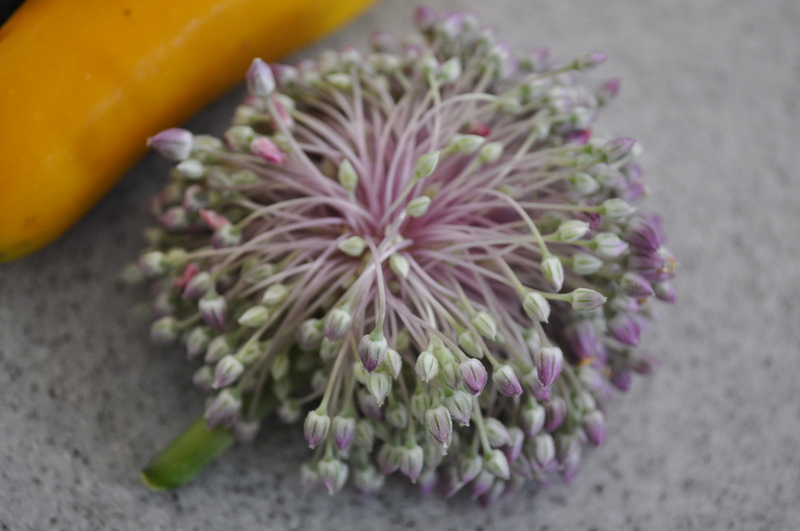 Beautiful garlic blossom. I had never tried one before, so Colinwood Farm was kind enough to send me home with one to try! I have to say…it’s a new favorite! Simply pinch off a few blossoms and sprinkle on salad, stir-fry, you name it! They have a light garlic flavor and a little punch. Slice into slivers or chunks. Whatever your heart desires! Immediately top with cheese to get some delicious melting action. Perfect for lunch or dinner! Enjoy! Cook farro according to package. I used 10 minute farro from Trader Joe’s. Drain any excess water. 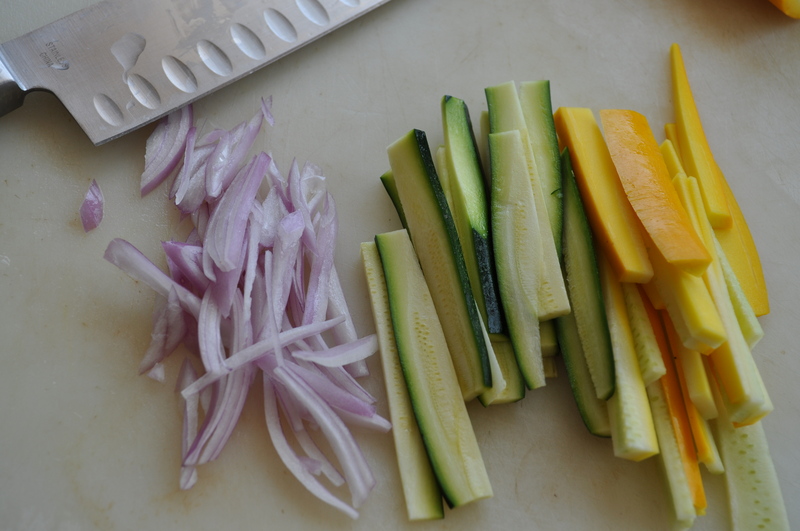 Meanwhile, slice both zucchini and shallot into thin slices. Heat a splash of oil, about 3 teaspoons, in a skillet over medium-high heat. Once shimmering, add zucchini and shallot. 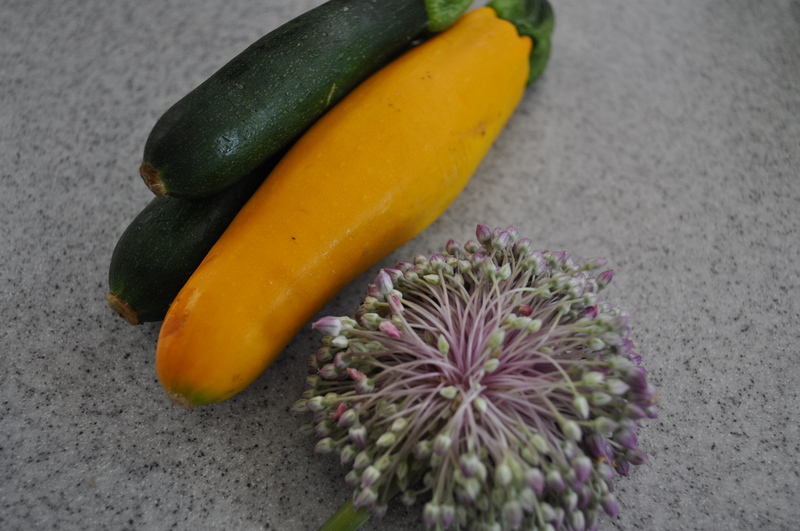 Season with salt and pepper to taste and cook until zucchini is tender. Transfer farro to a bowl. 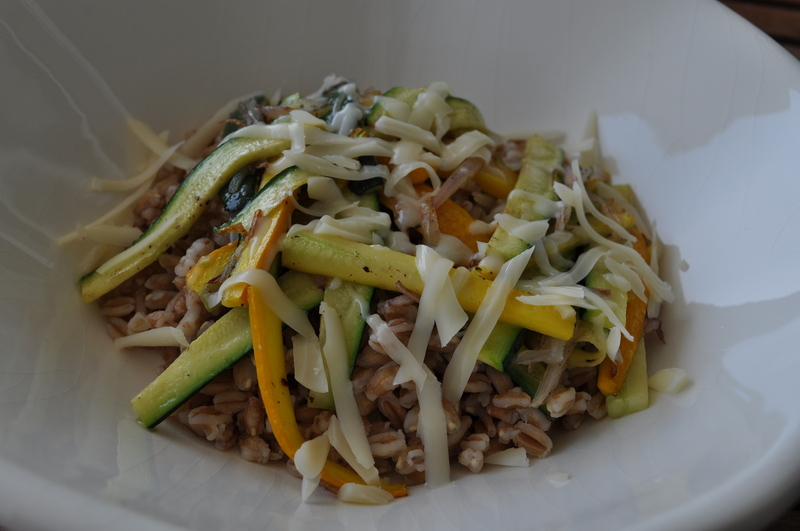 Top with zucchini mixture, shredded cheese, and a drizzle of olive oil. Season with salt and pepper. If you’re feeling adventurous, add some extra flare and top with a pinch of slivered almonds and garlic blossoms.